Although some anaerobic and aerobic mesophiles have long been known to grow at alkaline pH (above 9.5), little was known until recently about thermophilic alkaliphiles, termed now alkalithermophiles. 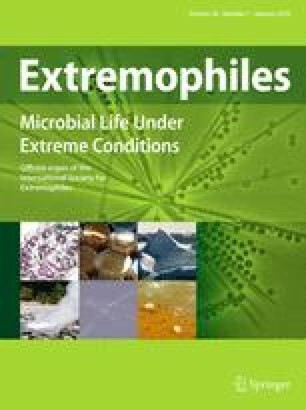 This minireview describes presently known and recently validly described anaerobic alkalithermophilic bacteria (pHopt55C > 8.5; Topt > 55°C) and alkalitolerant thermophiles (pHopt55C < 8.5 but pHmax55C above 9.0). Some of these are widely distributed, but others have been isolated (thus far) only from one specific location. This novel group of anaerobic bacteria is comprised of physiologically different genera and species which, so far, all belong to the Gram-type positive Bacillus-Clostridium phylogenetic subbranch. An interesting feature of these anaerobic alkalithermophiles is that most of the isolates have short doubling times. The fastest growing among them are strains of Thermobrachium celere, with doubling times as short as 10 min while growing above pH 9.0 and above 55°C.